I thought I read you had kept back a few of your Freedom Rangers to see how they lay and maybe try to hatch. I was wondering how they did. Did they make it to laying age? If so, how often do you find they are laying eggs? Have you had any success with hatching? It is about high time I updated how our Freedom Ranger Project is doing, isn’t it? I’m glad for the reminder and happy to report that our Freedom Ranger hen is still… a chicken. As you may or may not know, the typical Cornish broiler chicken (they can go by other names too, White Mountain is one of them) are notorious for their short life spans, often not even making it to butchering day without breaking their legs or having a heart attack. 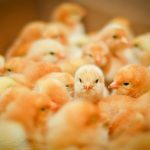 While it is true that you can grow them out faster than a Ranger broiler, we are ultimately concerned with the nutrition in the end product, not just the bottom line in dollars & cents. We would prefer for our meat birds to be converting fresh air, sunshine, plants, and bugs along with their feed ration into delicious meat. The fact that Ranger Broilers can do that is what originally attracted us to the breed. You know. All the things that make a chicken a chicken. And I can assure you that raising them has been a whole lot more pleasurable than the white broilers and we have no intentions of going back. 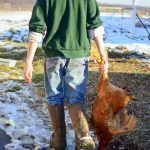 You may or may not remember, but two years ago, we decided we wanted to do a little experimenting with the Freedom Ranger broiler hybrid chickens so we kept a few back on butchering day. We wanted to answer questions such as those posed above… would they live? How long? Lay eggs? Reproduce? Could they be part of a sustainable home-based breeding program? We held back 3 pullets to see how they would do. Two of the three are no longer with us, but none of them died a natural death (so far). One we lost to a predator attack and a second was butchered during culling last winter. Assuming they would no longer be laying, we decided to add these gals to the freezer, but when the first one was being eviscerated, so many undeveloped eggs were discovered and the last gal has had her life spared to this day. Well, our last Freedom Ranger hen is now 2 years and 4 months old. I don’t know whether we’ll decide to keep her on just to see how long she’ll end up living, but typically we cull all hens after their third fall molt assuming they’ll no longer be productive enough to feed over the winter. That would be this fall. But we might make an exception. Our gals were laying us, oh, I’d say about 3-4 eggs a week their first year. They lay a distinct elongated egg, almost the size of a double yolkier. Nice, huh? I guess I haven’t been paying attention to whether or not she’s still giving us eggs now, but I can definitely say the rooster is still interested in her. Ahem. And when I went out to photograph her for this post she was hanging out in the nesting spot in the barn. You infer what you’d like from all that. I’ve never gotten technical with it, though it would be interesting to know precisely. 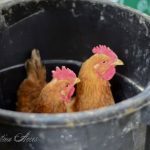 I can tell you that the day after the Brooder Mates of these hens went into our freezer they weren’t given another ration of feed until the first frost… Just like all our other layers. (We don’t purchase commercially prepared feed from last frost to first frost. Our chickens are old-fashioned like that.) Obviously, they continued to do well and even thrive since they still had enough energy and nutritional reserves at the end of the day to convert it into an egg. Ours never showed any interest in hatching their own eggs. Considering the fact they’re such hefty gals, that’s probably for the best for the undeveloped chick, I’d say. Probably not. We decided not to keep back any Freedom Ranger roos’. By harvesting age, they were some pretty rough characters. Chasing hens, crowing, beating up on each other. They mature to manhood by 12 weeks of age! (That’s young!) So we have never had a Ranger x Ranger chick. Instead we opted to simply use our rooster for breeding. He was a Buff Brahma and he didn’t survive a Great Horned Owl picking him up by the head, poor chap. It was late in the season and the largest replacement we could get was a Black Australorp. He’s been with us for a couple years now and is the absolute sweetest rooster we’ve had (and we’ve gone through a lot!) and that is more important with all these little children around than size, so he gets to stay. Point being, he’s not a big guy. From what research I’ve done, this is to be expected. The Rangers are so hybridized, they can take on any of the characteristics of the original parents, but not the hybrid parent which would be the heavy set, faster growing chicken we’re shooting for. At this point, I’m not sure. Definitely not for meat production. The logistics of trying to find a cross that would work, setting aside the eggs, and incubating them, etc.. It would be quite a long project and right now we have so much other stuff going on and our set-up is so efficient that I don’t think we’d be interested in giving the experiment the time it would need. As layers though, they make for an interesting prospect. It’s all I can do to convince my 2-man Butchering Crew that a spent laying hen is worth the time it takes to butcher them for their bones alone to be used for stock-making. To have a nice heft carcass like that would certainly make it worth their while. Especially when you’re considering that, like the layers, they don’t require the year-round feed as I already mentioned. Have you ever raised Ranger Broilers? What do you think of the breed? Not knowing enough about your fencing & security situation I don’t want to be the one to say for sure it’s safe to have a bull with kids. We had 4 strands of electric fence and felt comfortable with it. That said, when the cow came into heat he was able to break a wooden gate to get closer to here (there was a second gate thankfully!) The only time it was ever an issue for us was when she was in heat or when the calf was crying for mama- he was real attached to the calf for some reason and busted through an electrified polyrope line to come to the rescue. NEVER TRUST A BULL NOT TO HURT YOU!!!!! I AM A DAIRY VET AND HAVE SEEN WAY TOO MANY COLLEAGUES BE INJURED HORRIBLY BY BULLS! Dairy bulls are especially aggressive because they tend to be raised individually. A young bull that you consider tame and friendly will become more aggressive as they get older. Bulls are very unpredictable. One day he can just snap and charge when you are bringing the ladies in for milking. Please reconsider getting a bull. In case this was some subtle test to see who is really paying attention , you said, “We don’t purchase commercially prepared feed from first frost to last frost.” I’m thinking you meant that the other way around? At any rate, thanks for a great article! 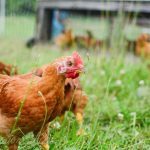 Can you explain why you don’t purchase commercially prepared feed for a certain time of the year? Just because you let them free range and that’s enough? 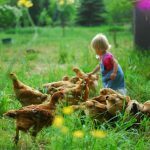 Or do you feed them something else during that time period in addition to free ranging? Funny, we were told that is what our kids should bring. I don’t think we will do that again. We raised Freedom Rangers this year for the first time. Only lost one of them a few weeks before butchering day. We haven’t decide if we will raise them again, but likely. Thanks for the update. Hello, I am just finding your page for the first time today. I have read several of your posts and enjoyed them very much. I apologize for the ignorance because I’m sure your regular readers know, but what type of bird do you raise for meat if not the Cornish X and not the Freedom Rangers? We tried the Cornish X this year and were not pleased with their “lifestyle choices” as you discussed above, so we are trying to decide on another breed. Thank you for the thoughtful posts and useful information! Reading back over that, I suppose it wasn’t very clear- sorry. We do raise ranger broilers- have a batch almost ready to butcher and another we picked up this week. We continue to be highly impressed with the breed. It’s their offspring we aren’t interested in raising for meat. What two birds create a “freedom ranger”?